Chris (Jack) Clark spent most of the 1970′s as the first National Secretary of the Michael Harrington-led Democratic Socialist Organizing Committee, a predecessor to Democratic Socialists of America. Jack Clark had previously quit his job as a reporter for the Chelsea Record to join Harrington in NYC to help organize an opposition caucus within the rightward-moving Socialist Party USA. He was the first managing editor of Democratic Left, has been a delegate to meetings of the Socialist International in Geneva and Vancouver, has led DSA in countless progressive campaigns in NYC and MA. Jack Clark has also edited Food Monitor for World Hunger Year in Washington DC, worked for eleven years as Deputy Director for Policy and Planning in Boston for the Mayor’s Office of Jobs and Community Services, and since 2002 as Director of Workforce Development for the union-funded Transportation Learning Center in DC. DSOC's leadership at the 1979 convention included Chairman Michael Harrington, Vice-chairman Julius Bernstein, Vice-chairman Victor Reuther, and National Secretary Clark. The national board consisted of Julian Bond, Harry Boyte, Bogdan Denitch, Harry Fleischman, Irving Howe, Alex Spinrad, Gloria Steinem, Harry Walsh, Nat Weinberg, and Richard Wilson. 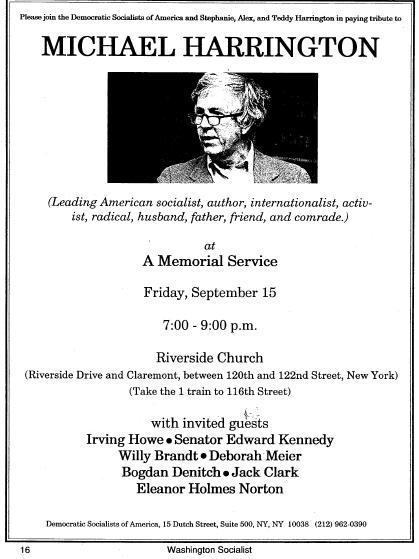 On Friday September 15, 1989, a tribute service was held to commemorate the recently deceased leader of Democratic Socialists of America, Michael Harrington. Invited guest speakers were Irving Howe, Senator Edward Kennedy, Willy Brandt, Deborah Meier, Bogdan Denitch, Jack Clark and Eleanor Holmes Norton. In 1990, Jo-Ann Mort and Michael Schippani (chairman), were contacts for the Democratic Socialists of America Labor Commission. Other members included Tim Sears, Penny Schantz, Paul Baicich, Carl Shier and Jack Clark, a DSA National Political Committee member, then working for the Massachusetts Secretary of Labor. In 1994, Clark of Massachusetts was a member of the Democratic Socialists of America Steering Committee. In 1999 there was a new editorial team at Democratic Socialists of America's Religious Socialism consisting of four co-editors: Maxine Phillips, Andrew Hammer, Rev. Norm Faramelli, and John Cort, assisted by Harvey Cox, Cornel West (Charles West, the Princeton theologian, was also a contributor), Jack Clark, Rev. Judith Deutsch, David O'Brien, and Michael Eric Dyson and Rev. Marcia Dyson. "Grateful mention should also be made of Jack Spooner and Curt Sanders, who kept Religious Socialism alive from 1988 to 1998, with help the last few years from David Seymour and Lew Daly." Doug Butler, Kathy Casavant, Jack Clark, Harris Gruman, Julie Johnson, Eleanor LeCain, Marcia Peters, Mike Prokosch, Bruce Raynor, Bob Ross, Rep.Frank I. Smizik. In 2002 former Boston DSA Chair and National DSA Director Jack Clark left Boston for a new job with the transport workers union in Washington, DC. Jack Clark spent most of the 1970s as the first national secretary of the Michael Harrington–led Democratic Socialist Organizing Committee, the major predecessor organization to Democratic Socialists of America. Jack had previously quit his job as a reporter for the Chelsea Record to join Harrington in NYC to help organize an opposition caucus within the rightward-moving Socialist Party, which eventually became DSOC. He was the first managing editor of Democratic Left, has been a delegate to meetings of the Socialist International in Geneva and Vancouver, has led DSA in countless progressive campaigns in NYC and MA—and in his travels as a DSA organizer once debated Ron Paul! Jack has also edited Food Monitor for World Hunger Year in Washington DC, worked for eleven years as Deputy Director for Policy and Planning in Boston for the Mayor’s Office of Jobs and Community Services, and since 2002 as Director of Workforce Development for the union-funded Transportation Learning Center back in DC. Jack Clark , supported the Democratic Socialists of America Unity grouping, established for the 2017 Democratic Socialists of America National Convention in Chicago. In 2018 Jack Clark was an original signatory of the DSA North Star founding principles statement. This page was last modified on 4 February 2019, at 03:37.